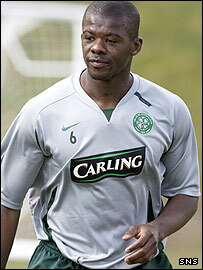 Celtic will allow defender Bobo Balde to leave on a free transfer, if he can find a suitable deal elsewhere. The 32-year-old Guinea international has a year of his contract to run but has not been a first team regular under manager Gordon Strachan. Bolton were keen on the centre half in January but Balde picked up an injury at the African Nations Cup. This time last year, Balde turned down an approach from Sunderland, who were prepared to pay £1.5m for him. Balde moved to Celtic Park from Toulouse seven years ago but has played just 14 times in the past two seasons.